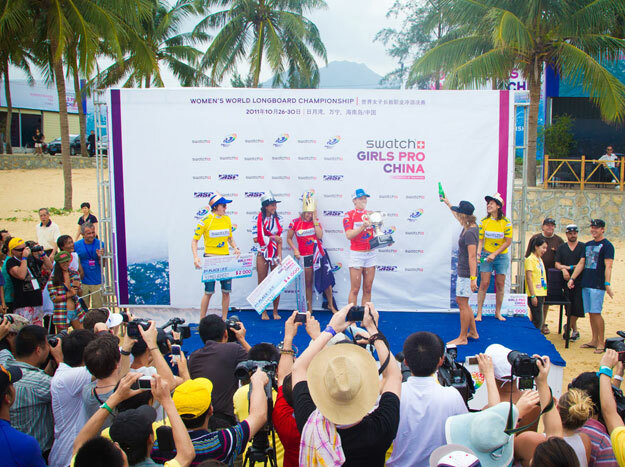 For the first time in the history of women’s longboarding, top female longboarders are seemingly being treated the way they ought to be treated at every event: like world-class athletes, like champions. The pride they must feel at being able to participate in something historically unique in professional surfing, where they are not simply individuals competing for a trophy, but a part of something larger than themselves, must be extremely moving. To be a part of the narrative of one’s culture, to be woven into the fabric of the cultural tapestry, is the dream, albeit often times an unspoken one, of anyone who chases titles, championships and notoriety of any sort. We are creatures of language who have told stories since sounds began to shape the contours of our throats and mouths. Whether myth, rumor, ballad, epic, gossip, tragedy… we are both stories and storytellers, subjects (or objects) of texts and text-makers, immersed in a sea of meaning and meaning-making. As the first glimpses of the historical first ASP event in China are meted out to the media and flowing to the public and myself, I am reminded of this meaning-making tendency. I am taking a good hard look at how the spectacle is being commodified and how the overall meaning of the spectacle itself is being revealed. Often, it is what we don’t see and what we aren’t reading that is the most illuminating. I’d like to offer a different reading of the texts being presented. The event is significant enough for Brodie Carr himself to attend and present a welcome speech to the ladies in attendance alongside the Mayor of Wanning. “Hundreds of people” are said to have attended the opening ceremony… though I don’t quite know what to make of the fact that most of them seem to be wearing color coordinated shirts and to be sitting in sections of similar shirt color, pink, yellow, red, white… (Pre Event Photos Gallery 03, photo 5). This observation is not meant to poke fun at Chinese uniform, but to highlight the possibility that the crowd was specifically arranged. Additionally, it was noted by one of the competitors that the event had one hundred and fifty volunteers. Are these the “hundreds” that showed up to the opening ceremony? Who were also present to greet the arrival of the surf media, the judges and the competitors with cheers? What is not clear – at least from the later photos of the event – is whether hundreds of people were present for the ladies’ heats. At the time of this writing, given the close-cropped images and lack of panoramic photos available of the scene on the beach, it seems that the choice to run the event mid-week on an island that was recently connected to the mainland of China by high-speed rail and is known as a resort location replete with golf courses, famous festivals and encourages internal tourism with a government tax rebate program, might not have been enough to flood the beaches with spectators not connected with the event itself. The ASP has been in this dilemma before: Remote locale, lack of spectators on the beach… Solution: Live Webcast! Only there is no live webcast, no live soundbites and no live interviews for this event. There are, however, live web scores… thrilling. Is this event really business as usual for the ASP? What about Swatch? What about social networking as advertisement? I tried to find hashtags for the event on Twitter and I found two tweets with the hashtag #swatchgirlspro. I tried to find updates on my peers’ Facebooks but could not. There are some photos leaking through on Facebook and on Twitter through instagram and one early comment that one of the surfers had arrived, then relative silence. When the ladies were in France, there were updates as the women won or lost their heats. They were supported by family and friends throughout the experience via social networking. Either the ladies have all changed their behavior, social networking is no longer a viable advertising outlet for Swatch and the ASP, or there is something else going on. Something, perhaps, tied to the reason there are no live webcasts, no live commentary… it is far easier, after all, to control your propaganda and to censor your narrative if there is no live text to monitor. This is conjecture on my part, but to witness this silence occurring at an event of this size and import, is quite unsettling. As it turns out, China has a ban on both Facebook and Twitter. This could very well be the least spectated world championship event in the history of the ASP. Sadly, we are not learning anything new about the women competing in the event; these group of women who are participating in what the surf media is touting as a historic moment in the history of surfing. Most people who track the ASP World Tour do not know these women’s unique stories, their characters, personalities or ambitions. We are only learning how they feel about and their limited experience of, an island-bubble in China created solely for them, the surf industry and tourism. I wish more time and space were allocated to delving into these women’s lives, which are rich and complex and far larger than their ambition to win a world championship. These women who have chosen to be a part of the narrative of surfing over and over, despite being trivialized at every turn.